What is the best Sit-Com to you? Friends. Sienfeld. Cheers. Home Improvement. Growing up in the 90s, in the small town of Firth, Idaho, just twenty minutes south of Idaho Falls, Idaho, I was brought up on the fun loving sitcoms of the 90s. The 90s was the peak of great television, when it came to situational comedy. Here at the Group Real Estate we love talking about our favorite shows growing up, or ones we still love to watch today. Every night after school, at 4 o clock, Home Improvement was on. I would sit down to enjoy the very family friendly sit com, starring Tim Allen as Tim “the Tool Man” Taylor. This show was all about the many follies that came upon Tim at work as a handy man tv show host, with his family, working on his projects at home, etc. It made us laugh at the common man and the follies we all encounter, but didn’t mock the dad, the husband, the father much like The Simpsons does with Homer. I enjoy the Simpsons, as much as the other guy, but there is zero relateable qualities to the characters in the Simpsons. With Home Improvement, we have all been there. Tried our best to be the man, fix stuff, or watch our dads fix things and it all fell a part. Sometimes in a very silly, funny way. 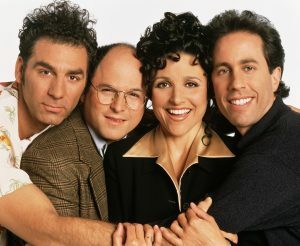 Seinfeld was much different. Literally a show about nothing, taking the comedy sketches he would do in his stand up, and write 20 minute episodes based on those sketches. I never got into Seinfeld, but there are a lot of people that put it up there with Friends and Cheers as the pinnacle of all sit coms. As I have gone back through and watched episodes now, as an adult, I appreciate the brilliance even more of the “nothingness” that the show is about. The acting isn’t the best, but that is apart of the nuance that makes it great. It’s much like watching a Saturday Night Live skit, where they are laughing and breaking characters, at point. It brings a great realness to it. Now on to Friends. 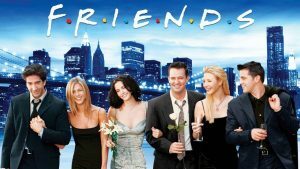 This is where the bias, and almost movie like critic will come out from, but I believe Friends to be the best sit com ever conceived. There is a strange relatable quality to these characters, while still being a bit over the top as to make us laugh at each situation. The reactions are real and none of them are made up. The way the performances comes through, when actors laugh, in a real way, at the other actors’ doings, it truly makes it for a special treat. The stories are fantastic and anyone who truly has friends that are that close, will instantly fall in love with the characters in this show, what they do for each other, how they react to each other, etc. One other thing that Friends did over all other 80s and 90s sit coms, is it also wasn’t afraid to go serious in tone when needed. Break ups were real and heartfelt, adoptions made us cry, Phoebe carrying triplets for his brother but having to give them up. There were many moments that brought tears to our eyes from sadness or realism, as there were from making us laugh so hard we cried. Those that I didn’t grow up with these shows are able to go back and watch them through Netflix or Hulu. What is great, is you will hear kids who were babies in the 90s or even born in the 2000s, who love these sit coms. That is why these are sit coms that truly stand the test of time. They still make us laugh. They are still relevant to our world today, to the things we go through on a day to day basis, and something there, in a very dark world, to bring light and laughter to all of us.